University of Nebraska Press, 9780803288546, 186pp. Rare voices in fiction, the lives of the working class consume this collection. 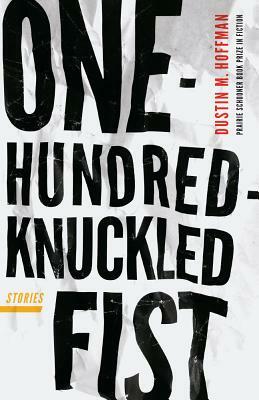 Winner of the Prairie Schooner Book Prize in Fiction, One-Hundred-Knuckled Fist brings to life the narratives of midwestern blue-collar workers. In these sixteen stories, author Dustin M. Hoffman invites readers to peek behind the curtain of the invisible-but-ever-present “working stiff” as he reveals their lives in full complexity, offering their gruff voices—so often ignored—without censorship. The characters at the heart of these stories work with their hands. They strive to escape invisibility. They hunt the ghost of recognition. They are painters, drywall finishers, carpenters, roofers, oil refinery inspectors, and hardscapers, all aching to survive the workday. They are air force firemen, snake salesmen, can pickers, ice-cream truck drivers, and Jamaican tour guides, seething forth from behind the scenes. They are the underemployed laborers, the homeless, the retired, the fired, the children born to break their backs. One-Hundred-Knuckled Fist initiates readers into the secret nightmares and surprising beauty and complexity of a sweat-stained, blue-collar world.